It's a little more expensive than we'd like, but it feels built to last and is undoubtedly useful to have lying around. Works well. Very handy. Decent build. 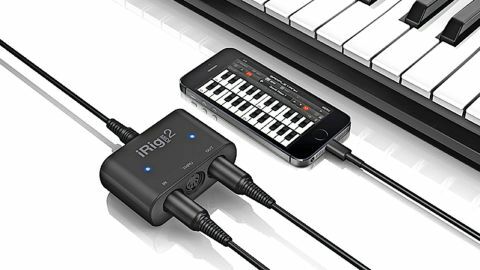 iRig MIDI 2 is the latest in IK Multimedia's seemingly never-ending line of iOS-friendly music making accessories. "It's a great device for anyone who wants to hook their iOS instruments and music making apps up to a DAW"
This a particularly handy bit of kit though - a highly compact MIDI interface that comes with a detachable connector, allowing it to be used easily with both your iOS devices and Mac or PC. Lightning and USB leads come included with the unit, and a 30-pin connector is available separately for hooking up older Apple devices. On the front it features MIDI In, Out and Thru ports, making it nicely flexible and ideal for incorporating into your compact, portable production set-up. It's a great device for anyone who wants to hook their iOS instruments and music making apps up to a DAW in a hassle-free, plug and play manner.